Product differentiation on store shelves is getting a helping hand from the IoT. To turn in-store browsers into buyers, solution providers need to help retail customers accelerate their use of IoT, including technologies such as augmented reality (AR). A company that recently took the plunge into AR is Treasury Wine Estates (TWE), an Australian-based global winemaker and distributor that owns more than 40 popular brands, including Napa Valley’s BV, Beringer and Acacia. For the company’s newest brand, 19 Crimes, TWE worked with J. Walter Thompson and app developer Tactic to create a series of animated characters for its label. With the help of AR and a mobile app, the bottle labels can “talk” to a buyer as they browse wines on store shelves. To create this in-store experience for shoppers, Treasury Wine Estates and its project partners built an AR mobile app that can interact with the labels for the Hard Chard, Red Blend and Banished varietals in the 19 Crimes series. Once a buyer downloads the app and points her phone camera at a bottle on the shelf, the character on the label—one of the infamous rogues—becomes animated and tells his personal crime story. The shopper can also share the AR experience on social media. 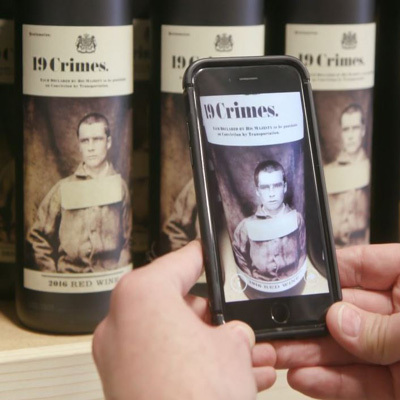 According to Treasury Wine Estates, the goal of using AR technology on the label was to offer consumers a new way to engage with the 19 Crimes brand. The Tactic team created the personas of the animated characters, making each one unique. Tactic combined its expertise in character animation and visual effects with its knowledge of mobile AR to create the integrated shopping experience. The company knew this particular wine series was an ideal test bed for animation-based storytelling. The 19 Crimes label is modeled on the founding of Australia as an English Penal colony. The label depicts a portfolio of prisoners who were banished to their new fate. Tactic used various voice talent to portray each character, and modeled each one to seamlessly animate from the brand's signature lines. To date, the new technology seems to be locking in buyers, as 19 Crimes is currently one of the fastest-growing brands within the TWE portfolio. According to the company, 19 Crimes has grown to one million cases in annual volume over the last 12 months. While the in-store experience for shoppers created by Treasury Wine Estates is unique, the use of AR in online shopping tools has already spread. Furniture store IKEA has an augmented reality catalog that enables shoppers to visualize how certain pieces of furniture could look inside their home. The app measures the size of the products against the surrounding room and fixtures to offer a true-to-life size, whenever possible. Amazon recently added AR View on its Amazon shopping app. This feature allows customers to check what new products might look like in their home or office before buying them. Shoppers can select from thousands of items, including vases, toasters and furniture, and overlay the 3D images of the item using their phone’s camera. This use of AR allows buyers to get a better idea of dimensions and visualize the product in its future environment. These early examples all point to future growth for AR technology in retail. Gartner predicts that by 2023, 25% of customer service and support operations will integrate virtual assistant technologies of some variety, including AR or robotics. This estimate is up from less than 2% last year. Learn more about the 19 Crimes AR app developed by Tactic and watch the video to see it working on the store shelves.